Don't want to commit to a fully enclosed garage? How about a partially enclosed carport? We have carports for sale with sides and ends open or closed. Many different size carports with customizable layouts are available. Looking to cover your vehicle from exterior weather conditions? Need to protect your car from hail damage? Look no further. Our carports for sale can be customized for full or partial protection. Choose from different roof styles and over a dozen colors. Our carports for sale are assembled & installed on your site. Pricing is provided online and includes installation and anchoring. These carports are considered portable in that they can be dissembled, un-anchored, and moved. However some counties or city zoning ordinances may consider them as permanent since they are anchored. We can install on most any level surface, including ground, gravel, concrete, or asphalt. The carport sample shown below includes both sides enclosed, rear end wall enclosed, and a front gable end. This provides optimum protection without fully enclosing it into a garage with a door. Perhaps you need more clearance for entry into the carport, simply remove the gable end option to open up the peak area. The picture below shows a 22’ width carport which is great for 2 vehicles and still have enough room to open doors. The length of 40’ provides extra storage space or added room to park 4 vehicles in rows of two. Our carports for sale include standard bracing and post spacing needed to be strong and durable structures. We also offer engineer certified units rated for wind and snow. These units include extra bracing and depending on the size and area may include extra bows and/or special anchors to provide a tough long lasting unit, able to withstand strong winds and heavy snow. All of our carports for sale also include peak braces on every truss or bow. If you are looking to purchase a carport from anywhere else, make sure braces are included. We offer two different roof styles on our carports for sale; the economical Regular Rounded style and the attractive Box Eave A-frame style. Both styles provide excellent coverage with horizontal roof panels and are equally sturdy. Typically the difference between the two is simply personal preference. However depending on the size of your unit, you may prefer the Vertical Roof upgrade. This is only offered on the Box Eave style. Vertical Roof upgrade turns the panels on the roof to match the slope or pitch of the roof. This is recommended for longer units and for heavy snow prone areas. In addition the Vertical Roof option is easier to clean and debris or ice will slide off faster. To price the Vertical Roof option, choose the Box Eave style and proceed to pricing. Vertical Roof will be listed as an option to add. ​If you are planning on turning a carport into a garage, by closing in the sides and adding doors later on you have come to the right place. 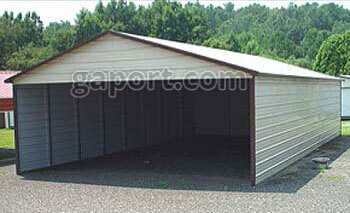 All our metal garages start out as a Box Eave style carport with Vertical Roof. Some of our customers prefer to begin with an open or partially closed vertical roof carport to break up the cost. We can add-on, close in, or even extend most carports at another time more convenient for your finances. That is why our carports for sale are the most versatile and budget friendly on the market! Ask us about adding on to your carport today. ​To view our carports for sale, simply click on metal carports from our home page and choose a style to proceed. We have a few different photo galleries showing a variety of options, layouts, and colors. If you need help deciding on what size carport or options you need, feel free to contact us. Our knowledgeable sales reps stand by ready to assist you. They have experience guiding our customers thru our website, and helping design a carport to meet your individual needs. Our employees do not work on commission, they are trained to simply answer any questions you might have and assist you in any way possible. While we may offer suggestions or recommendations, we will never try to upsell or promote a size or option that you do not need. Our customers are very important to us and it is our determination to help you choose a structure that will accommodate your requirements in the most efficient way possible. So take the next step! Our friendly expert staff awaits you! Call and quiz us on our carports for sale.